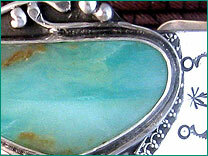 I love to help people wear the stones and designs that are meaningful to them. My job as a jewelry maker is to help each precious Stone find it’s Person. For custom designs, I can email photos of stones and/or past work. You can choose your stone and tell me which of my styles of jewelry you like best. Please contact me directly via email or FB message to discuss a custom piece of jewelry. There is nothing quite like wearing a piece of jewelry that you have had a part in creating. It becomes uniquely yours, and different and special as you. Click here to contact me about starting your new custom designed jewelry.